Back at the Pillar of Eliseg again, this time accompanying University of Chester Computer Science student Matt Williams together with colleagues Paty and Ruth and visiting Portuguese scholar Bruno. 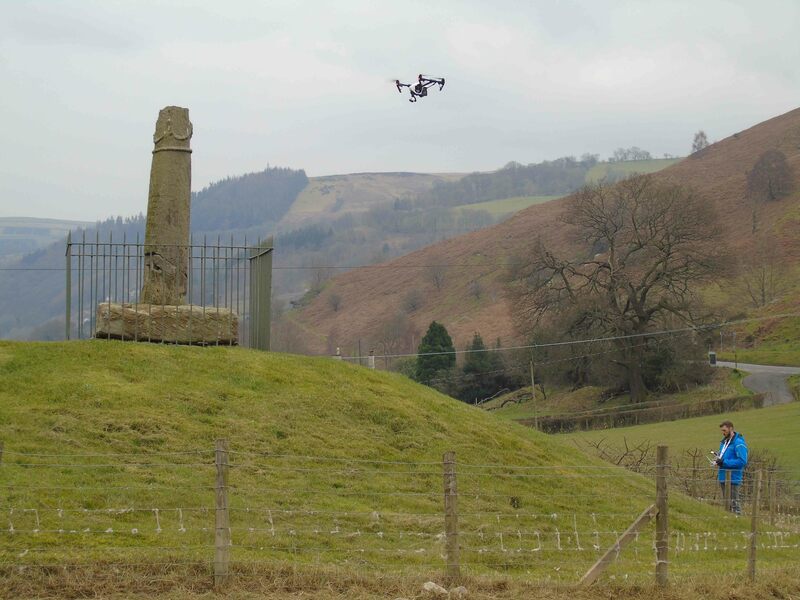 Our task was to fly a drone around the monument (I assure you we didn’t get as close as the zoom lens photograph suggests), to take a detailed all-round photographic record of the monument for comparison with the replica in the Llangollen Museum. The aim is for Matt to work on exploring the original and replica in comparison with each other in terms of surface erosion, as well as to see if detailed photogrammetric analysis of the monument can discern more details of its form and text. In short, the title of this post is not a reference to my constant droning on about the monument, but our first attempt to drone at the monument. 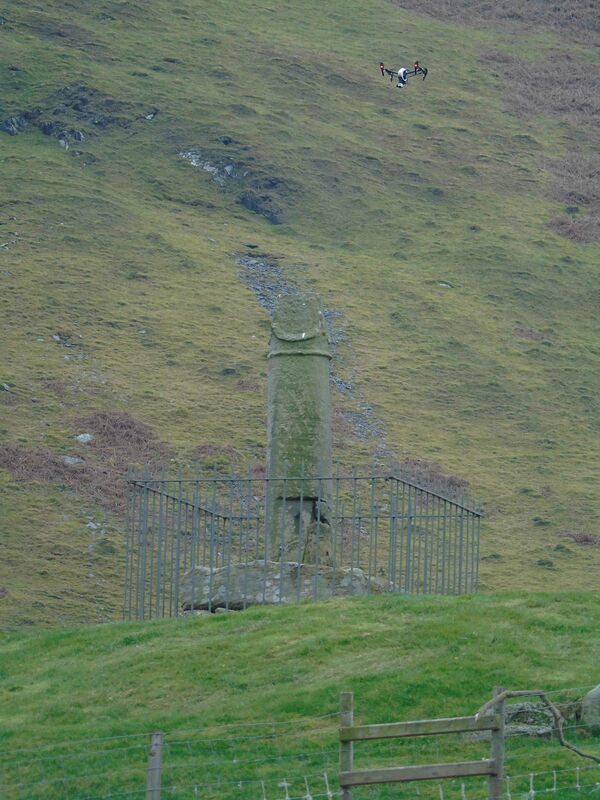 The Pillar of Eliseg is a unique near-in situ ninth-century cross-shaft fragment re-set in its original base placed on a multi-phased Bronze Age kerbed-cairn near Valle Crucis Abbey, Denbighshire. 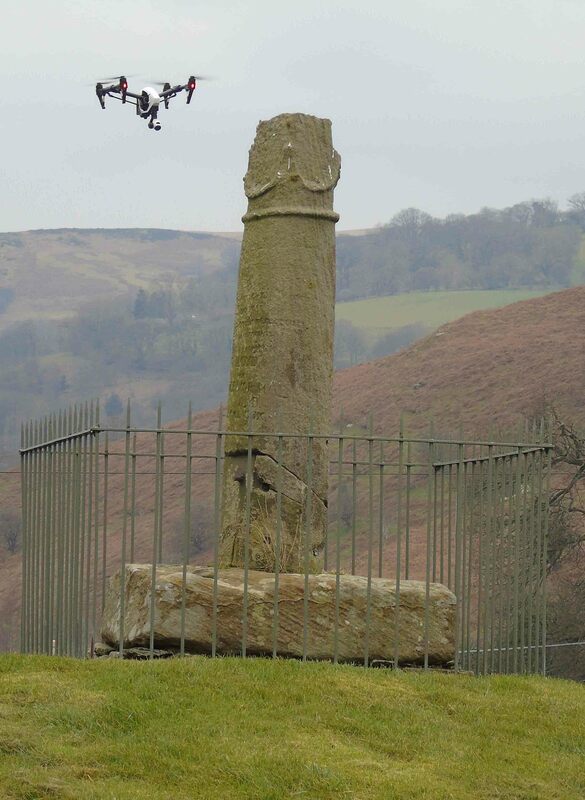 The early 9th-century ruler of Powys, inscribed on a monumental stone cross a lengthy Latin inscription commemorating his immediate forebears and legendary ancestors and set it up as a prominent landmark within a side-valley of the Vale of Llangollen. The cross became a famed ancient holy place throughout the Middle Ages, fell (or was pulled) down in the early 17th century, was restored in the late 18th century (minus the cross-head) and has been a focus of visits and speculation ever since. Project Eliseg, involving Bangor and Chester universities, is investigating the mound beneath the early medieval monument for the first time using modern archaeological methods. Between 2009 and 2012 the project surveyed and excavated on the site and following a post-excavation stage of analysis we are currently writing our results up for publication. Ongoing work by the Past in its Place project – undertaken by Dr Patricia Murrieta-Flores and myself – is investigating the landscape context of the Pillar. Drones are increasingly being used to recording standing buildings and ancient monuments. Our work today will help us to understand both the past biography of the monument but also to consider the medium-long term future of the monument as it is exposed to the Welsh open-air environment.